I recently had a chance to visit the “Ranganthittu Bird Sanctuary” which is also known as “Pakshi Kashi” of Karnataka is in the Mandya District of the state of Karnataka in India. It is on a gorge formed in the river Cauvery and comprises six islets. Ranganthittu is located at 3 kilometers away from the historic island town of Srirangapatna and about 16 kilometres north of Mysore. 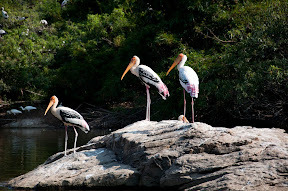 It is an important bird sanctuary of India. The park is home to a large flock of Streak-throated Swallows. I had the luck of photographing the muddy nest being built by the flock of those cute little swallows under a rock protruding in the riven which was in a low tide, as it were. Here are those shots in an album. I would love to change the world, I just don't have the source code yet.